Established protocol for cell- or solid-phase bound C4 and C4d split product by flow cytometry using FlowPRA® Class I and II screening test beads from One Lambda. For detection of cell- or solid-phase bound C4d and C4d split product by flow cytometry using FlowPRA® Class I and II screening test beads from One Lambda. 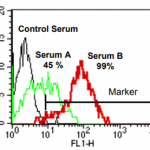 This antibody will identify human complement split product C4d. It is suggested to be a valuable marker for humoral rejection of transplants (kidney, heart, lung). 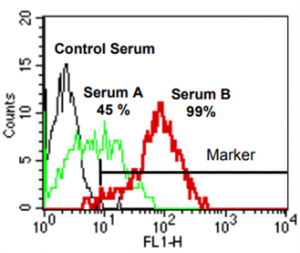 The antibody is applicable for detection of cell- or solid-phase bound C4 and C4d split product by flow cytometry using FlowPRA® Class I and II screening test beads from One Lambda, Inc. Storage instructions: for one month at 4°C. For prolonged period of time, aliquot and store at -20°C to -80°C. Avoid repeated freeze-thaw cycles. The FlowPRA® Screening test (One Lambda, Inc., Canoga Park, CA, USA) consists of a pool of 30 different microbead preparations coated with either purified HLA class I or HLA class II antigens from different cell lines covering all common HLA antigens. According to the manufacturer´s protocol this assay is applicable for detection of anti-HLA class I or II IgG alloreactivities (Ref. 1). The [C4d]FlowPRA test was developed for detection of anti-HLA alloantibody-triggered C4d deposition to FlowPRA® beads by FITC-conjugated anti-human C4d antibody. As an adjunct to standard FlowPRA® screening, this test allows for selective detection of presumably more harmful classical complement-activating anti-HLA alloantibodies. The [C4d]FlowPRA test may represent a specific alternative to conventional complement-dependent cytotoxicity (CDC) PRA testing (Ref. 2). Read the entire protocol before beginning the test. Incubate negative control serum or test serum (9 μl) with 0.5 μl FlowPRA® class I and 0.5 μl FlowPRA® class II beads*. Incubate for 30 minutes on ice. C4 levels, and normal CH50 activity. Wash beads twice with cold phosphate-buffered saline (PBS). 6. Add 20 µL working dilution (1:25) of FITC-conjugated C4dpAb2 to 20 µl beads suspension (final dilution 1:50). Wash beads twice with cold PBS and analyze by flow cytometry. histograms. The marker is set according to staining with the negative control serum. Results are expressed as percentage of positive events. [C4d]FlowPRA (HLA class I) screening of representative sera (serum A, serum B) obtained from two presensitized patients. A FL-1 histogram (FlowPRA® HLA class I beads are gated) is depicted. The marker is set according to C4d staining obtained with a non-binding control serum. The percentage of positive events, which represents %[C4d]FlowPRA reactivity, is indicated for the two test sera. 1. [C4d]FlowPRA screening--a specific assay for selective detection of complement-activating anti-HLA alloantibodies. Wahrmann, M., Exner, M., Haidbauer, B., Schillinger, M., Regele, H., Körmöczi, G., Böhmig, G.A., 2005. Hum. Immunol. 66, 526–534. 2. Simultaneous HLA Class I and Class II antibodies screening with flow cytometry. Circulating alloantibodies encounter the grafted endothelium as the first target. Living endothelial cells can rapidly eliminate bound antibodies from the cell surface by “capping”, “shedding” or “internalisation”. biomarker in kidney transplantation but also in heart, liver, and other transplants. Detection of T and B cells specific complement-fixing alloantibodies using flow cytometry: A diagnostic approach for a resource limited laboratory. Jain, D., Dorwal, P., Pande, A., Tyagi, N., Mehra, S., Raina, V., 2017. Asian J Transfus Sci 11, 171–179. Global quality assessment of liver allograft C4d staining during acute antibody-mediated rejection in formalin-fixed, paraffin-embedded tissue. Neil, D.A.H., Bellamy, C.O., Smith, M., Haga, H., Zen, Y., Sebagh, M., Ruppert, K., Lunz, J., Hübscher, S.G., Demetris, A.J., 2018. Human Pathology 73, 144–155. Pros and cons for C4d as a biomarker. Cohen, D., Colvin, R.B., Daha, M.R., Drachenberg, C.B., Haas, M., Nickeleit, V., Salmon, J.E., Sis, B., Zhao, M.-H., Bruijn, J.A., Bajema, I.M., 2012. Kidney International 81, 628–639. Prospects and limitations of post-transplantation alloantibody detection in renal transplantation. Böhmig, G.A., Bartel, G., Regele, H., Wahrmann, M., 2009. Human Immunology 70, 640–644. Review article: Luminex technology for HLA antibody detection in organ transplantation. Tait, B.D., Hudson, F., Cantwell, L., Brewin, G., Holdsworth, R., Bennett, G., Jose, M., 2009. Nephrology 14, 247–254. In vitro detection of C4d-fixing HLA alloantibodies: associations with capillary C4d deposition in kidney allografts. Bartel, G., Wahrmann, M., Exner, M., Regele, H., Huttary, N., Schillinger, M., Körmöczi, G.F., Hörl, W.H., Böhmig, G.A., 2008. Am. J. Transplant. 8, 41–49. Antibodies, isotypes and complement in allograft rejection. Böhmig, G.A., Bartel, G., Wahrmann, M., 2008. Current Opinion in Organ Transplantation 13, 411–418. Antibody-Mediated Renal Allograft Rejection: Diagnosis and Pathogenesis. Pivotal Role of Complement-Fixing HLA Alloantibodies in Presensitized Kidney Allograft Recipients: Role of Complement-Fixing HLA Presensitization. Wahrmann, M., Exner, M., Schillinger, M., Haidbauer, B., Regele, H., Körmöczi, G.F., Hörl, W.H., Böhmig, G.A., 2006. American Journal of Transplantation 6, 1033–1041. Complement C4d in Graft Capillaries - the Missing Link in the Recognition of Humoral Alloreactivity. Feucht, H.E., 2003. American Journal of Transplantation 3, 646–652. The Clinical Importance of Alloantibody-Mediated Rejection. Halloran, P.F., 2003. American Journal of Transplantation 3, 639–640. Kidney transplants, antibodies and rejection: is C4d a magic marker? Nickeleit, V., 2003. Nephrology Dialysis Transplantation 18, 2232–2239. Terasaki, P.I., 2003. American Journal of Transplantation 3, 665–673. Humoral rejection in kidney transplantation: new concepts in diagnosis and treatment. Mauiyyedi, S., Colvin, R.B., 2002. Current Opinion in Nephrology and Hypertension 11, 609–618. C4d FlowPRA is a useful tool in live related renal transplants. Dorwal, P., Pande, A., Mehra, S., Tyagi, N., Jain, D., Raina, V., 2014. Pathology 46, 471–472.